Get ready for a few posts full of photos with a look back one year ago of Luis and I backpacking Japan for our honeymoon. This was our first view of the city. One word.. busy. Of course the first thing we did was go straight to the closest park, Ueno Park and eat! I loved all the little details throughout the city, I mean just look at the cuteness of a sewer covers. Yes! You read correctly, the sewers tops/covers were even cute! Breakfast. Fish at 6:00 a.m., oh yea! Tsukiji Fish Market. The lovely smell of fish at 7:00 a.m. in the morning, after eating fish for breakfast. Let’s just say we didn’t last long exploring the fish market. The amazing Akihabara district (the gaming district), and you know Luis and I love games! The Shibuya District ( Tokyo’s night life district) at night. I just wanted to show the crowds that are in Tokyo, always a crowd in the streets of Tokyo no matter the time; day or night. When we were in the city I couldn’t wait to get into the countryside to get away from the crowds, but then when we were in the country I wanted to be back in the city and be a part of that rush. Such a strange feeling. Coming next, our trip to Hakone, Japan to visit Mount Fuji. The other day Luis had a friend from Miami stay with us for a day while he searched for his future home while he attends Georgia Tech. As a thank-you for letting him crash on our super soft comfy couch he treated us to our first meal out. He chose a place that was about 3 minutes from our place called Wasabi Grill. The atmosphere was cozy and it kind of looked like it could have been a tapas restaurant at one time. 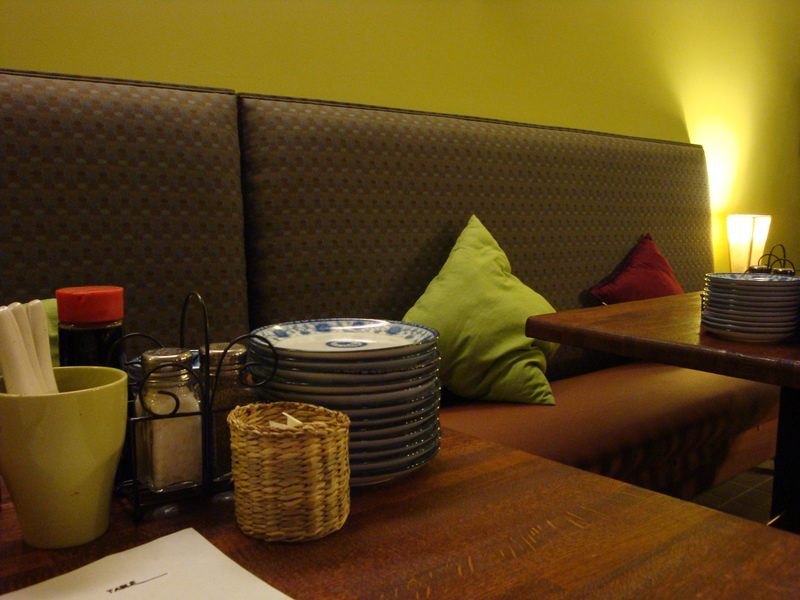 I don’t know why but I love when restaurants have a booth option to sit instead of the usual chair… not sure why. For $2.50 I had a cucumber and crab salad. I wish it had a sauce with more flavor, but I enjoyed it. 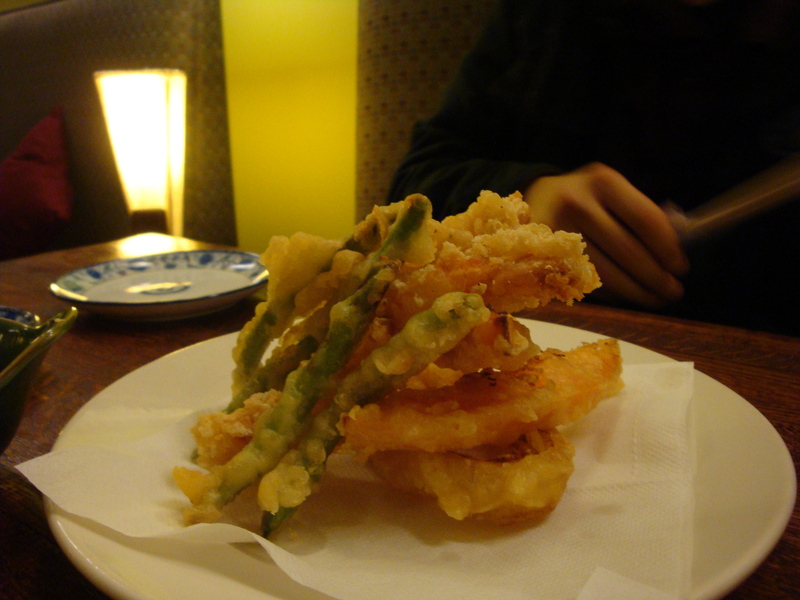 He had a veggie tempura mixture for about $4.00 that he seemed to really enjoy. I also had the tuna tuna roll ($10.00). 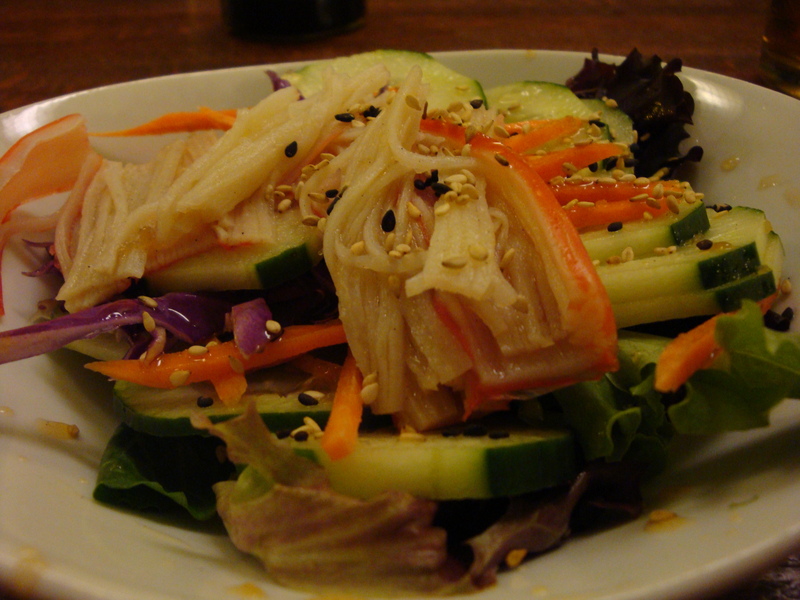 Tuna on top with a tuna kimchi mixture inside. 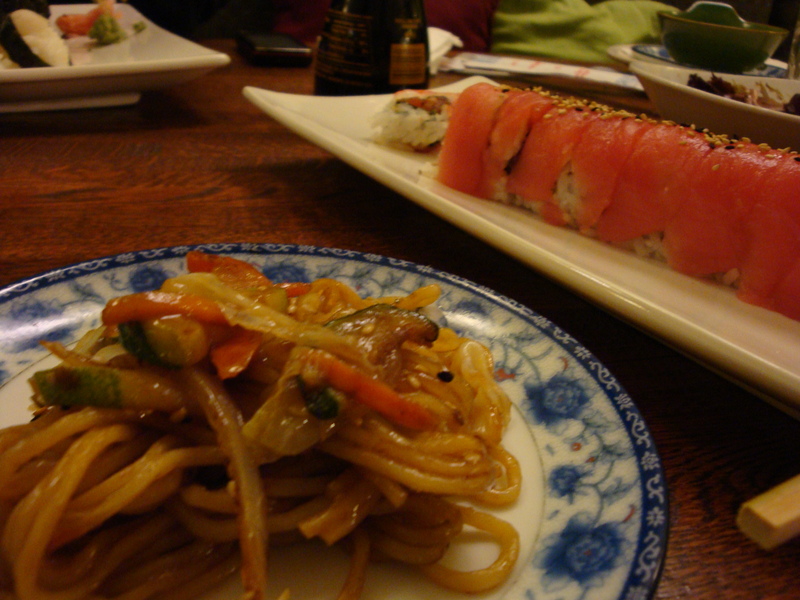 Luis saw that they had one of his favorite dishes while in Japan on the menu, Yakisoba ($8.00). It was pretty good, but not the same as Japan. It was a little too saucy and my tuna roll was a regular sushi roll, nothing creative. We gave this place some good points for being so close to home and easy on the pocket book. I am already planning to go back and try the kimchi fried rice. I just wish the sushi menu had more variety and some more creative ingredients.